Made with durable 18/8 stainless steel, the Primus Campfire Cookset has everything you need to cook a meal. The two cook pots include convenient colander lids for straining pasta and vegetables. Designed to withstand years and years of service, the large Primus Campfire cookset provides the tools you need to prepare the perfect gourmet meal, whether cooking on a stove or a campfire grill. 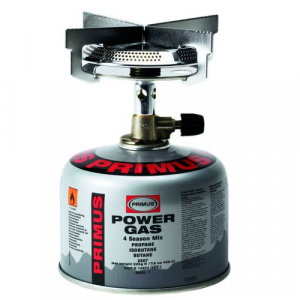 The Primus Campfire Plate is made of durable, food-grade 18/8 stainless steel, and has high sides to keep your food on your plate, even if it's balancing on your knees as you sit around the fire. 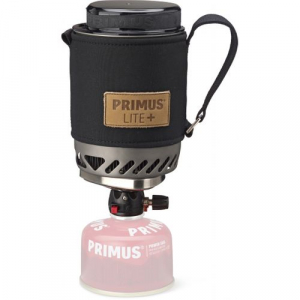 The Primus Essential Lite 1.3L camp stove kit is a lightweight aluminum pot with an integrated burner and windscreen to protect the flame and provide stability. 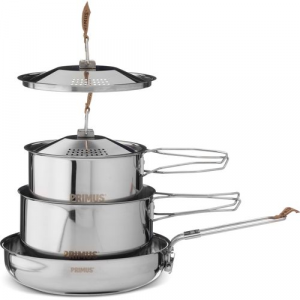 Boil water and cook 1-pot meals fast and efficiently with the Eta Lite stove system from Primus. The pot attaches to the stove burner for great performance and convenience on your backpacking trips.